The deeds of Bahram Gur, who ruled Iran in the 5th century, were recorded in the Persian epic, The Book of Kings. Here Bahram is shown out hunting on a camel with the harpist Azadah. To show his prowess, he shoots an arrow to pin the hind leg of a deer to its head. 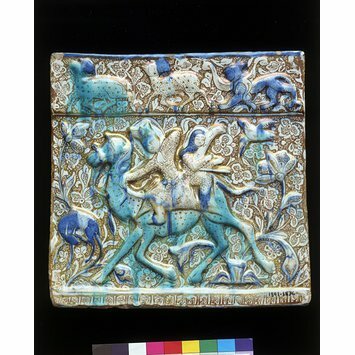 Tile from a frieze at the palace of Takht-i Sulayman with a moulded design, copper-green and cobalt-blue painted into the glaze, and lustre decoration painted over the glaze. The main scene depicts Bahram Gur, future king of Iran, out hunting with his favourite slave girl, the harpist Azadah. Bahram Gur fires a shot at a gazelle that scratches its ear with its foot. The arrow will pin the foot and the ear to the animal's shoulder. 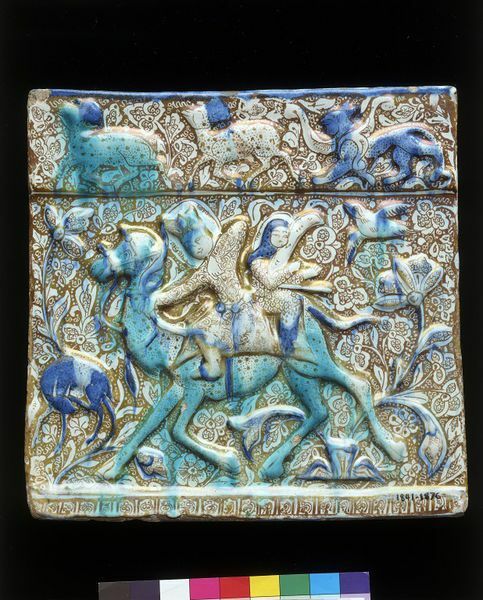 Tile from the Ilkhanid palace at Takht-i Sulayman with moulded decoration showing Bahram Gur hunting on a camel in the company of Azadah, fritware under a tin glaze, with blue and turquoise painted into the glaze and lustre painted over the glaze, Iran, Kashan or Takht-i Sulayman, about 1275.